In this MarTech Monday episode, we unbox AI for marketing by explaining the science behind it and offer up some practical examples of how AI is being used by companies today like Netflix and Amazon and now in B2B. 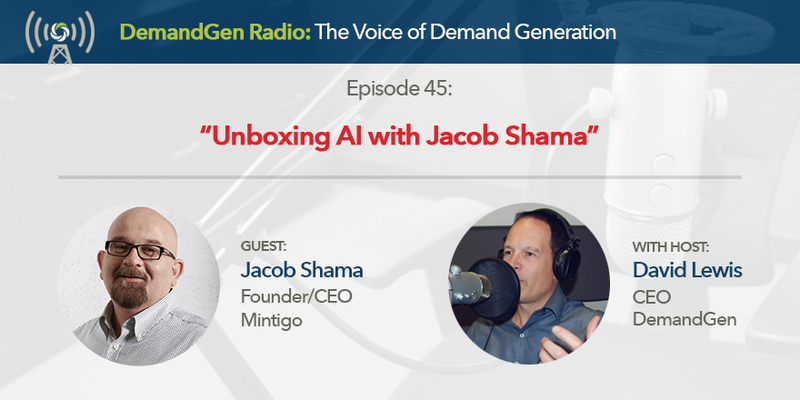 I'm joined by Mintigo Founder and CEO Dr. Jacob Shama, a true pioneer in AI, who developed his expertise for AI while hunting "bad guys" as a member of the Israeli Defense Forces (IDF) and author of the book Intelligent Customer Engagement powered by AI. Jacob explains how insights are captured and used profiling along with the core components of AI including data science, machine learning, and autonomous programs. I hope you enjoy these new MarTech Monday episodes that are designed to help you understand the power of these advanced Martech methodologies and systems.